Dahua Technology has launched a range of extended Power over Ethernet (ePoE) cameras, network switches and network recorders that enable integrators to go beyond usual transmission distances. Dahua ePoE IP products support up to 800 metres between camera and network switch or NVR. This solution overcomes the limitations of traditional Ethernet and PoE, which restrict cable runs between network ports to 100 metres. This eliminates the need for Ethernet extension units and intermediate repeater network switching. These revolutionary products are ideal for seamless analogue-to-IP migration involving IP video, audio, control and power (4-in-1) transmission over coax cable using an ePoE-BNC adaptor. The extended PoE transmission achieves distances of 800 metres at 10 Mbps/13W or 300 metres at 100 Mbps/25.4W. Dahua’s internationally respected R&D capabilities have seen the company outperform competitive brands by being the first provider to make this technology available commercially. Dahua has developed a wide selection of cameras using the new approach, covering resolutions from 1080P to 4K in many formats, including box, bullet, dome and eyeball. Integrators also benefit from the company’s varifocal and fixed lens types, which meet most project requirements. 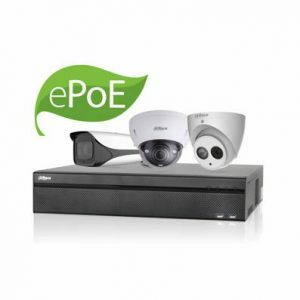 The ePoE series has been developed from Dahua’s eco-savvy 3.0 portfolio and inherits class-leading functionality, including Smart Video Detection (tripwire, intrusion, abandoned/missing detection), as well as facial recognition and Smart H.265 encoding. The ePoE network recorders have eight green ePoE ports that support long-distance PoE transmission. There are three models with 2/4/8 SATA ports for differing storage needs. Dahua has deployed an advanced H.265 chipset to support 4K and H.265 decoding, with performance of up to 16 channels at 1080P, or four channels at 4K as live view or playback. As a sub-category of the company’s Pro series NVR, the ePoE NVR inherits Smart Video Detection, Smart H.265, ANPR and point of sale (POS). It is compatible with standard Ethernet or PoE cameras and switches, making it a perfect fit for system migration and hybrid solutions. The ePoE network switch has four ePoE ports that provide long-distance transmission (300 metres at 100 Mbps or 800 metres at 10 Mbps/EoC) when connected with ePoE cameras. The switch supports plug & play and no additional configuration is required to achieve exceptionally long transmission distances. There is also robust protection against lightning strikes and surges, which avoids the need for additional equipment and costs. The switch will even work with non-ePoE cameras, offering transmission of 100 metres at 100 Mbps. These new ePoE devices have many applications, but are ideally suited for the type of extensive perimeters found at warehouses, car parks, shopping centres, factories, science parks and critical national infrastructure (CNI). Dahua achieves economies for both the integrator and the end-user by avoiding the use of repeater devices and the related power supplies and junction boxes that are necessary with conventional approaches to long cable runs. All parties in installation projects appreciate that fewer units means fewer points of potential failure. Dahua’s innovative solution is also preferable to the use of fibre optic transceivers on long-distance transmission, where a power supply is required for both the transceiver and camera. Dahua has simplified network structure with this game-changing product set, as only one cable is required to connect front-end to back-end devices. Higher reliability, streamlined installation and lower maintenance costs all follow. This is a simple solution that delivers seamless plug & play functionality. It can significantly reduce the cost of analogue-to-IP migration and give the integrator a greater range of options by accommodating more flexible surveillance system designs.